Let's Travel to Quiet Savannah GA USA on Tuesday in 2014! SAVANNAH Georgia (January 1, 2014) -- No one says to give up the non-stop romantic weekend getaways. A new idea comes from Romantic Inns in Savannah for the folks who enjoy quiet getaway travel, just for personal time and quiet new experiences. "Maybe it's time for simply a couple's getaway without the kids or a nice pause from work," says Green Palm Inn innkeeper, Diane McCray. 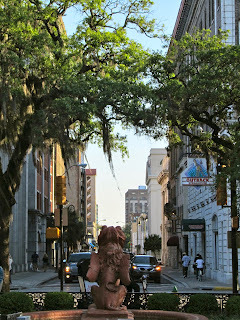 "We think you will love a few Tuesday trip ideas in Savannah, GA USA!" Looking at the 2014 calendar, we find even the popular holidays falling on Tuesday are just about the quietest days for a Savannah, Georgia trip -- Fat Tuesday (Mardi Gras, March 4), April Fool's Day (April 1), Earth Day (April 22), and Veterans' Day (November 11). Here are a few quiet Savannah, Georgia trip ideas with emphasis on quiet Tuesdays! In January 2014 get away for a quiet culinary tasting trip during Savannah Restaurant Week (January 24 - February 2, 2014) on Tuesday, January 28, 2014. Prix fixe menus abound at top local restaurants and artisan cafes in downtown Savannah and Tybee Island (only 20 minutes drive from the historic district). They're romantic spots, too, that offer quiet time and quiet places to try new foods and Savannah dining spots affordably and unhurried. In February 2014, SCAD's deFine Art showcases its contemporary and fine art, opening on Tuesday, February 18, 2014. The event is February 18 - 24, 2014. In March 2014, make Tuesday a music-packed day during the Savannah Music Festival -- March 20 - April 5, 2014. Starting with concerts at 12:30 p.m. on Tuesday, surprisingly these are music-filled weekdays with blues, mandolin and qawwali music, jazz piano, lunchtime and evening guitar concerts. Tuesday is a great day to try recommendations from Annette White's "Bucket List of 25 Things to Do in Savannah". "City art museums and mansion museums that are closed on Monday are open on Tuesday. The long lines at popular restaurants on weekends in Savannah are shorter or non existent on Tuesday," adds Zeigler House Inn's Jackie Heinz. April 22, 2014, is Earth Day -- an ideal day for a trip in Savannah to experience nature's beauty in springtime. Once called "Forest City", you'll want to visit the urban forest of Forsyth Park's Arbitorium, Tybee Island beach, and walk the famous Savannah squares (mini garden parks) that dot the National Landmark Historic District. When one gets out on the Georgia coast waterways around Savannah, you'll hear the sounds of nature -- the Atlantic Ocean waves and shore birds at Tybee Island beach. Take a Georgia Barrier Island day trip with Wilderness Southeast, Bull River Marina's boat tours, or a Capt. Mike's Dolphin Tour near Tybee. Kayaking tours are available to get out on Johnny Mercer's famous "Moon River", near Skidaway Island State Park, and Little Tybee Island. By now, we hope we have painted a mental picture of how delightful and quiet Tuesdays are in Savannah. Get here if you can! The privately owned bed and breakfasts of Romantic Inns in Savannah will have more quiet ideas for your Savannah, Georgia trip on Tuesday or any day. Email all the inns here. Follow us also on Facebook, Twitter -- @RomanticInns, and find more ideas we have posted in Pinterest. Savannah Benefactors: Savannah's Drayton Street is a 'Thank You' to Ann Drayton of Charleston's Magnolia Plantation. SAVANNAH Georgia (December 15, 2013) -- Our bed and breakfast collection of family-owned Romantic Inns in Savannah offers a nod to Savannah benefactors. Today we point to a few who supported our once-fledgling British colony of Georgia on the banks of the Savannah River. Prominent among the stalwart benefactors is Ann Drayton. Her name stands out among the roles of notable male benefactors. in the National Landmark Historic District. Without thinking of gender, we read street names and square names. However, most honor men benefactors or heroes. Earl of Abercorn, for whom Abercorn Street is named, contributed £100 [English pounds] to help underwrite the cost of transport of the colony's first immigrants. Colonel William Bull, Lieutenant Governor of the South Carolina, came to Savannah with twenty laborers. He and Georgia founder, James Edward Oglethorpe, laid out the now famous Savannah City Plan. Bull Street is the main north / south street in Savannah's National Landmark Historic District. The Governor of South Carolina, Robert Johnson, gave seven horses. South Carolinian Joseph Bryan came to help settle the colony with four sawyers [those who saw timber for a living], giving the colony two months work in the colony. Bryan Street runs east and west, passing Johnson Square. Right in the hub of Savannah's first-named streets is Drayton Street, named for Ann Drayton. Mrs. Drayton is the widow of Thomas Drayton, Jr. -- of the famous Drayton family who still own Magnolia Plantation in Charleston, South Carolina. Magnolia Plantation and Gardens (70 acres) dates to 1676, when Thomas and Ann [Fox] Drayton built a house and small formal garden along the Ashley River (once the Kiawah River). It is clear that Ann Drayton held her own wealth to assist the Georgia colony after the arrival of settlers in February 1733. In April 1729, Thomas Drayton (the son) and his mother Ann petitioned the Charleston Probate Court for a division of his father Thomas Drayton, Jr.'s estate. The petition states that Thomas the younger was "desirous to take into possession" of his share of his father's estate in order to establish himself as a planter. The petition was granted. lion at the Cotton Exchange is in foreground. Historians write that there was a competitiveness among South Carolina's notable families to outshine and outdo one another, assisting the new Georgia colony. After all, the new English settlers and settlement would be the important military and civilized buffer between the British in South Carolina and the Spaniards in Florida. What is along Drayton Street Today? Today a one-way street, Savannah's automobile traffic on Drayton Street runs north from Victory Drive to the strand on Bay Street near City Hall. 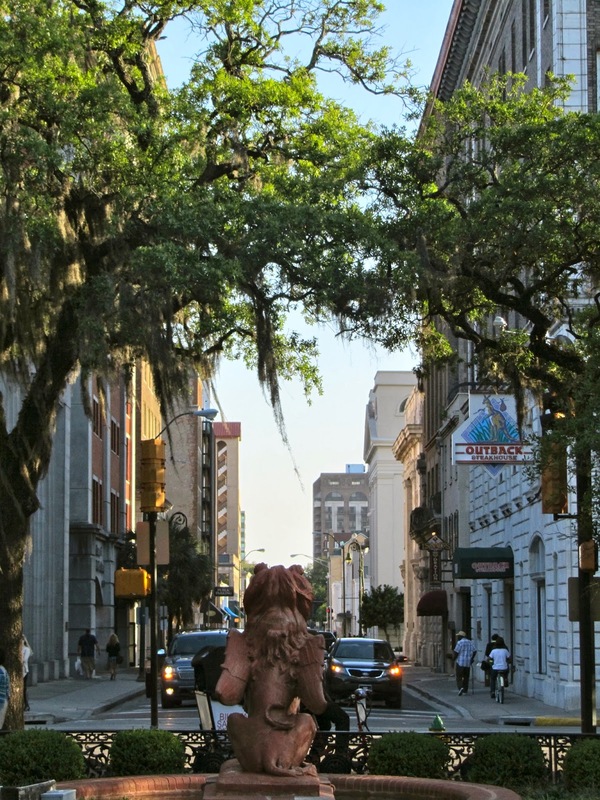 Drayton Street is the east boundary of Savannah's central park, Forsyth Park. Overlooking the south end of Forsyth Park is the former Telfair Women's Hospital, said to be visited periodically by a lady spirit in brown dress -- believed to be Miss Telfair. Mary Telfair endowed the Telfair Women's Hospital with the property located on the southwest corner of Park Avenue and Drayton Street and gave the building to the Independent Presbyterian Church. The grand building is now a private senior citizens home. Impossible to miss on Bay Street at Drayton Street the Old Cotton Exchange is center stage along Factors Walk. The international rate for raw cotton was set in only two places around the world in the 19th century -- at Savannah's Cotton Exchange or in London England. On the southeast corner of east Bay and Drayton streets stands the former Hibernia Bank, designed by architects Mowbray and Uffinger in 1914. 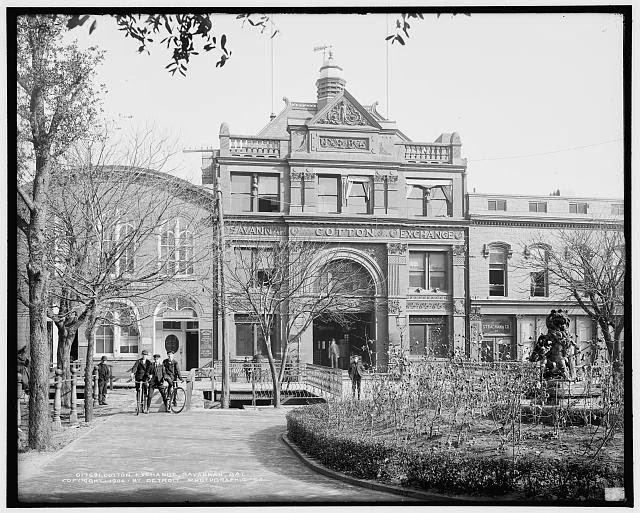 It presently houses the Savannah Chamber of Commerce and Visit Savannah offices. are from ginkgo trees in the Forsyth Park Arbitorium. Between Huntingdon (named for Lady Huntingdon) and Gaston streets along Drayton Street is the former Candler Hospital, now being extensively renovated by the Savannah Law School. Savannah Magazine touches on the Drayton Street tunnel, a topic of haunted storytellers in its "Beneath the Surface" feature (March 2013 by Beth E. Concepción). The phenomenally popular 700 Kitchens Cooking School, directed by Chef Darin Sehnert, is located at 700 Drayton Street. Grand architecture are features of Savannah College of Art and Design's Administrative buildings along Drayton Street. Clinard Hall ansion (ca. 1872; 618 Drayton Street) is described as "[a] three-story, 4,647-square-foot stucco Italianate building features quoins, stone windowsills and caps". Lai Wa Hall is located at 622 Drayton Street at Hall Street. "This circa-1877 structure once was the home of prominent Savannah financier and cotton broker Thomas M. Butler. Note its marble foyer, wrought-iron staircase and 13-foot coffered ceilings." Near Bay Street, Propes Hall (15 Drayton at Bryan streets) was "Built in 1895 and formerly the Citizens Bank building, Propes Hall was the first building in Savannah to be completely fireproof. Note the Renaissance Revival style architecture." Bradley Hall (115 East York Street) faces Drayton Street. "The 67,000-square-foot Mediterranean-style building was constructed in 1906 and originally housed the U.S. Marine hospital." Our 'Where to eat' tip: Just across York Street at Drayton is Zunzi's -- a take-out only sandwich shop that was featured by Adam Richman on Travel Channel. We highly recommend the award-winning Conquistador! If you miss the lunch time lines, try Zunzi's II, with roof-top and garden, dinner-only dining. It's located on Drayton Street at Bay Lane. The Girl Scouts first headquarters preserves the early history of Girl Scouts at 300 Drayton Street. It is the carriage house of the Andrew Low Mansion, founder Juliette "Daisy" Gordon Low's home. The Girl Scouts became the nation’s largest organization devoted to developing leadership, service and survival skills for young women. Until 1846, the old city jail was located along Drayton Street, where today's Andrew Low Mansion and Lafayette Condominiums are today, overlooking Lafayette Square. Insider's Tip: Look for stones marked "J.B." (Jail Bounds), the landmarks for debtors serving time for penance but permitted to be out of the white-walled jail. The popular Parker's Market Urban Gourmet (222 Drayton Street) is a fun spot to pick up a warm or cold beverage, incidental personal needs, or quick deli lunch or on-the-go breakfast. At the intersection of Gaston Street and Drayton Street is the brick mansion seen in the popular golf movie, The Legend of Baggar Vance. The movie (2000) starred Will Smith, Matt Damon, Charlize Theron, and was directed by Robert Redford. The beautiful home is a private residence. Located on the corner of Drayton and Liberty streets, the Drayton Towers is currently under extensive renovations for luxury condominums and apartments. It is the only international style architecture style in Savannah. At the intersection of Drayton Street and Liberty Street (once the southern limit to the city), is the new BT Byrd's at Drayton Tower (101 Liberty Street). The chic cafe offers a little niche place for breakfast, lunch or dinner to celebrate old school Savannah in uber modern ways -- a Southern Hot Dog with pimento cheese, bacon, and saffron slaw or the Bourbon & Tarragon Cured Trout Salad; scones, a glass of wine, or one of the full bar’s craft beers and cocktails with a cookie plate. The speciality is Supersized Hot Oatmeal Cookie Sandwiches with a multitude of sweet and savory fixings. Open 7 days a week. 9am-9pm. McDonough's Pub, voted Best Daytime Bar and Best Karaoke, is just across from the historic Savannah Theatre, a lively place for top-rated musicals year around. Situated facing Chippewa Square, the theatre holds the notoriety as the oldest theatre in continual operation in America. It backs onto Drayton Street. Songwriter and Capitol Record's co-founder's Johnny Mercer is a Savannah native. His birth home is two blocks to the east of Drayton Street, which he crossed to reach Forsyth Park as his playground. Just off Drayton Street is Catherine Ward House bed and breakfast (118 East Waldburg Street), a Romantic Inns member. Now after that little stroll up and down Drayton Street, don't you think it would be delightful to give Ann Drayton our renewed big thanks for her contribution to Savannah's success? Maybe a day trip to Magnolia Plantation and Gardens would be one way to do just that. The picturesque Charleston plantation is about a two-hour drive northeast from Savannah. We have more insider stories, which are among the wonderful reasons to stay at Romantic Inns in Savannah. Isn't it more fun to be in the know? Contact all our inns at once, here.